The aftermath of the Second World War was traumatic. The creation of the United Nations and the Nuremburg trials sought to reestablish political stability and a new moral order but these were again threatened by rivalry between the two great powers: the USSR and the USA. For a while divided by the Cold War, Europe decided to launch a unique political organization that would guarantee peace and restore its influence in world affairs. The victorious Allies decided on the key issues for the post-war period at the peace conferences, especially those of Yalta and Potsdam. In 1945, thanks to its role in the victory over Nazi Germany, the USSR was given new territories along its western border. The Allies’ occupation of Germany led to a division of the country at the end of 1949. Italy came out of the war deeply wounded, with its unity under serious threat. Poland was reconstituted further to the west. Hungary was forced to return territory it had annexed at the end of the 1930s. This map describes the division of Europe into two blocs and construction of the European Union during the Cold War. 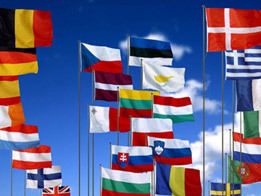 Aid offered by the United States for the reconstruction of European countries allowed the continent to remain part of the market economy. However, this aid was refused by the USSR and countries under its influence. Beginning in 1948, a series of crises demonstrated the Eastern European countries’ desire to throw off Soviet influence. Despite the scars left by the war, Tito managed, for a while, to reestablish Yugoslavia’s unity. Upon his death, Yugoslavian nationalist interests emerged strong and threatened to separate Yugoslavia into different countries. Cyprus became independent in 1960, but tensions between the Greek and Turkish populations led to partition. Emancipation of the ex-communist democracies and the collapse of the USSR led to a tremendous geo-political evolution. On obtaining their independence, the former USSR satellite states had to deal with new tensions but managed to negotiate a peace for transition. Yugoslavia’s collapse led to a series of military upheavals and saw its populations subjected to ‘ethnic cleansing’. As the number of member states increases, can the European Union remain a truly homogeneous entity?